Can Getting The Right Mattress Help Relieve Chronic Back Pain? Final Verdict: Which One’s The Best Mattress For Back Pain? Did you know humans spend around a third of their lifetime sleeping? That fact alone should tell you how big of a role your mattress plays in your life! So, yes, getting the right mattress can make a huge difference. When you sleep, your spine can finally take a moment to relax, the same way you like to do after a long day at work. But if your mattress is unfit for the job – and since you’re here, it probably is – the pressure will still be there, and your spine will end up misaligned and overburdened night after night. I think we can all agree that sleeping should be the relaxing part of your day – a chance for your body, as well as your mind, to unwind, and get rid of all the pressure. But what if you keep waking up with back pain? Well, I’d say it’s time for you to start looking for a new mattress – you can’t start your day off on the right foot when you’re in pain, right? And since I’m already on a never-ending quest to find new ways to improve sleep quality as much as possible, why not let me help you find the best mattresses for back pain? Deciding between best mattresses for back pain is not an easy task. Especially with the market being crowded with manufacturers and models, doing heavy marketing campaigns showing us their advantages. It would seem like everybody on the market is “the best” which would just confuse you. That’s why I decided to review and inspect the best mattresses on the market and grade them based on the three core values a mattress should provide to users. Check my comparison table out! Let’s talk about its triple-layer construction first. The mattress consists of a 2.5-inch thick layer of memory foam, followed by two inches of comfort foam, and 5.5 inches of high-density base foam, for a total of 10 inches of support and pressure point relief. That said, it never really reached its full 10-inch thickness. I’m starting to think this whole “ships compressed in a box” thing might not be such a great idea, after all. Why It’s Good For Back Pain: The mattress has a firm feel – not too firm, I would say – but it still manages to stay comfortable, making it the perfect choice for the side, back, as well as stomach sleepers. The mattress is infused with Castor oil, as well as green tea, which should help prevent the development of bacteria and odors naturally. The gel-infused memory foam with odor-fighting features might come in particularly handy in this case, since the mattress does tend to get a bit hot during the night. The mattress comes with a limited 10-year warranty. It’s not ideal, but it’s better than nothing, right? Don’t worry; Zinus has mastered the art of making one of the best mattresses for back pain at an affordable price – and this model is no exception. Would you believe me if I told you that I woke up singing “Sweet dreams are made of this” after the first night I spent sleeping on this one? That has to be one of the tell-tale signs of a good mattress! Unfortunately, though, that was after I waited for a good couple of weeks for the odor to go away. As a hybrid, the mattress combines the traditional innerspring construction with 1.5 inches of memory foam on top for a more comfortable sleeping experience. That way, this medium-firm mattress offers the best of both worlds – the support of springs, and the pressure point relief only memory foam can provide. 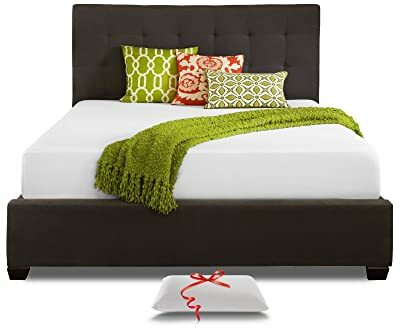 I was kind of hesitant about the foam and innerspring combo because I didn’t want to get a mattress that makes too much noise when you move around. I’m glad I got this one, though – no sounds, at all! So, if you’re a bit of a restless sleeper yourself, don’t be scared to give it a try. The most distinguishing feature of this 8-inch thick mattress has to be the fact that it’s a love child of memory foam and an innerspring mattress – a hybrid if you will. One thing I’ve noticed, though, is that the mattress feels way too soft around the edges. If you’re sleeping close to its center, you’ll be fine, but if you get near the sides, you’re risking rolling off the bed entirely. Sit on the edge, and you’ll see what I’m talking about here. A 10-year warranty covers the Linenspa hybrid mattress. Again, it’s not ideal, but it’s still something. The price is crazy affordable, too, which was a pleasant surprise – I expected it to be a lot pricier, given all it has to offer, you know? You know that feeling when you lie on your bed at the end of the day, and you can feel every last bit of tension leave your body? Yeah, I didn’t know, either – not until I got the chance to sleep on the Linenspa hybrid mattress, that is! Every time I have to spend a night away from home, I can’t wait to go back to this heaven-sent mattress! Tuft & Needle has gone over quite a few designs over the years, so I was interested to see what this one had to offer. The construction is pretty straightforward, double-layer one, so it’s something you’ll see in a lot of the best mattresses for back pain today. The T&N mattress strikes the perfect balance between bouncy and supportive, which makes it an excellent choice for all sleeping positions. There’s a noticeable lack of a transitional layer, though, which is why it seems a bit too firm for those that sleep on their side. However, if you don’t think the firmness will bother you, you should give this T&N mattress a try. What makes the mattress stand out is their decision to abandon the memory foam design for something a bit more advanced – the comfort layer is formed from their T&N Adaptive foam. One thing I’ve noticed is that all the movements are localized – if you share your bed with your significant other, you don’t have to worry about waking each other up anymore. Like many other mattress manufacturers, Tuft & Needle offers a 10-year warranty. Plus, the mattress comes with a 100-night sleep trial, so you have plenty of time to figure out if it’s the perfect fit for your aching back, or not. That said, they’re proud of the fact that over 95 percent of their customers opt to keep their mattresses. While it’s not exactly the definition of “budget-friendly,” I can’t say it’s ridiculously overpriced, either. It falls right in the middle – and you do get an excellent value for the price! I was very excited to give this one a try and see what Tuft & Needle came up with this time, but all in all, the mattress left me wanting more. Don’t get me wrong; it’s a great mattress. All I’m saying is there’s some room for improvements. Sleeping on the side wasn’t the most comfortable experience, so side-sleepers, beware. 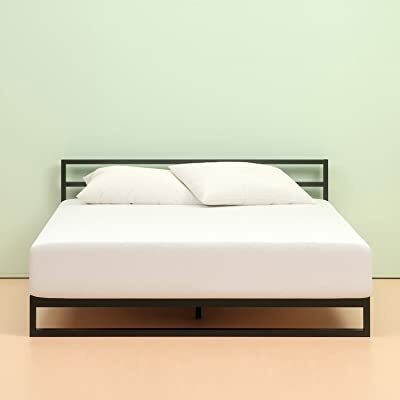 The dual-layer mattress design combines a two inches thick layer of memory foam with an 8-inch high-density base foam. Not only does it distribute your weight evenly, so that there’s no added pressure on your joints, but it also contours to your body, providing support, as well. However, there’s not much support around the edges – you either sink in, or you feel like you’re about to fall off the bed. It’s not a big deal, but it’s still worth mentioning. Most importantly, the materials are CertiPUR-US certified, meaning they’re safe, durable, and eco-friendly! What makes it stand out is the movement isolation feature – if you’re sharing your bed with a restless sleeper (or you’re the one who can’t stay still), know that all that tossing and turning won’t transfer to the other side of the bed. Finally, you can both get some sleep! The warranty it comes with is outright awful – there’s no better way to say it. The basic one is limited to one year (yes, you read that right), and covers manufacturer defects. That said, they do give you the option of paying for the extended version of the warranty. The affordable price comes as the icing on the cake. I’m pretty sure you’ll be able to afford this Signature Sleep model, no matter how tight your mattress-shopping budget is. I instantly fell in love with the movement isolation feature, and to be honest, the first thing I wanted to try was the wine glass test. I didn’t try it yet, though, but I’ll let you know how it went. The lack of support around the edges of the mattress is a bit of a disappointment, though. That said, if you are sharing your bed with a significant other, this might encourage you to sleep close to each other – which is always a plus in my book! 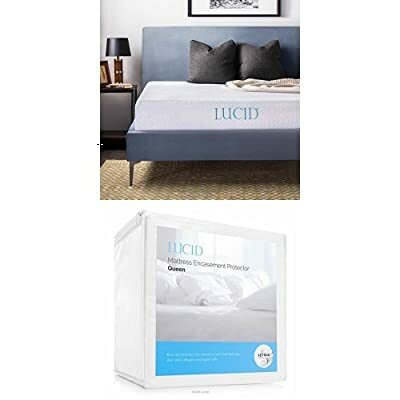 The 10-inch LUCID mattress features a double-layer design, combining a 2.5 inches thick layer of memory foam and a 7.5-inch layer of base foam with higher density. That said, you know how you’re supposed to rotate foam mattresses regularly? Yeah, good luck with this one – it’s massive! The top layer of memory foam is gel-infused and ventilated (but more on that in a moment), and should help ease some of the pressure points by conforming to your body. The high-density base, on the other hand, is more than enough to support your back and keep your spine aligned. The two layers work together to create a medium-firm feel, and a comfortable sleeping experience for back, side, and even stomach sleepers. The cover features the TENCEL blend fabric, which is supposed to help moisture control and temperature regulation. By creating a comfortable air layer, it makes sleeping on this mattress a lot more pleasant. But even if the cover might be great at temperature regulation, the mattress itself failed that test miserably – there’s too much heat retention going on in there. Every LUCID mattress, including this one, is backed by a 25-year warranty, meaning you can look forward to worry-free sleep for years to come. The fifth model on my list comes at a ridiculously low price – when it comes to affordability, this one’s hard to beat! So, if you’re working with a tight budget, consider this one. 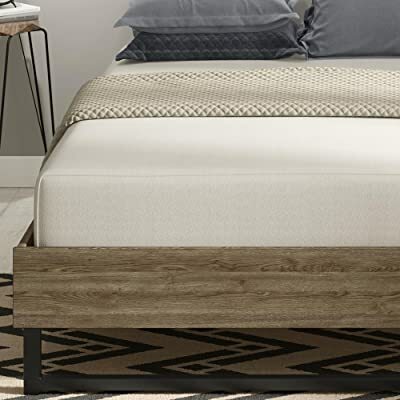 The main reason why included this one in my round-up was its price – if you can’t afford to spend a small fortune on a mattress, this one is the way to go. I tried sleeping on my back, side, and stomach, and I was pleasantly surprised at how comfortable it felt in all three cases. Unfortunately, it does tend to retain a lot of heat, so I’m not sure how great of a choice it would be for warmer climates. The mattress features a triple-layer construction with a total of eight inches of thickness. 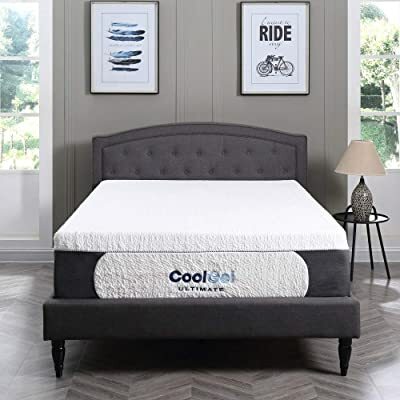 There are two inches of gel-infused memory foam, followed by 1.5 inches of comfort foam; the base is 4.5 inches thick high-density support foam. That said, the corners never reached their full potential during the expanding process, so I ended up with a saggy-looking mattress. It’s something you can expect from foam mattresses that are shipped in a box, though. What you get from the previously mentioned build is a medium-firm mattress suitable for all types of sleepers – back, stomach, and sides. So, no matter what your preferred sleeping position is, this mattress will be able to handle it. Again, the Zinus signature green tea memory foam is gel-infused, but this time, the foam contains active charcoal, as well, which, combined with the green tea extract, works on keeping your mattress fresh, moisture-free, and odorless. Much like the previous Zinus model I talked about, this mattress comes with a limited 10-year warranty, too. I wasn’t kidding when I said these guys know how to make the best mattress for back pain at an affordable price – this model is another budget-friendly one by Zinus! By the time I decided to give this one a go, I had already tried one of their best mattresses for back pain, so I guess you could say I knew what I was getting myself into here. At this price point, I don’t think there’s much more you can expect from a mattress without pushing it too far. Oh, and even the issues I’ve had with the first model came up with this one, too, so at least we know there’s some consistency there, right? 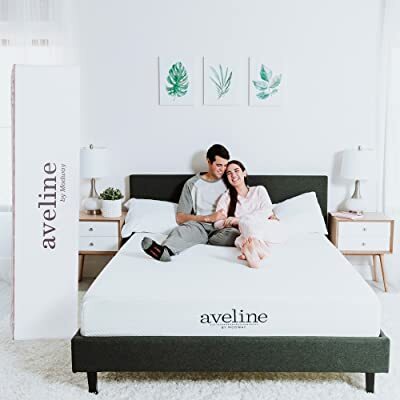 The Modway Aveline mattress comprises of two layers – 3 inches of gel-infused CertiPUR-US certified memory foam, and a 7-inch high-density foam base. Even with the lack of a transitional layer, the open cell memory foam does a pretty good job at keeping your spine aligned and reducing pressure on your major joints – from your shoulders down to your hips. Moreover, the mattress does a great job at reducing bounce between two sleepers. Again, if you share your bed with your significant other, this is the mattress both of you will enjoy. The secret is in the ventilated, open-cell memory foam, though. It does a great job at keeping the temperature under control throughout the night. You won’t wake up feeling like you were sleeping in a sauna, even during long, humid summer nights! Plus, I loved the fact that it came rolled in a box, and didn’t take more than a couple of hours to decompress entirely – by the end of the day, it reached its 10-inch thickness without any issues. The manufacturer backs up the mattresses with a 10-year warranty. There are cheaper models on the market – even on this list – but there are indeed some that are two, even three times as expensive. I’d say the Modway Aveline mattress falls somewhere in the higher end of the “affordable” range. I usually don’t buy into the whole “cooling effect” thing – I always feel like it’s nothing more than a marketing scam. So, imagine my surprise when this time it worked! I even gave it a try with the AC toned down, to see if it would still work on a hot summer night. And guess what? It did! If summer-season mattresses were a thing, this would be it! The combination of four different types of foam – 2-inch thick layers of gel, memory, and comfort foam, and an eight inches thick base – gives a total of 14 inches. That also means the mattress is super heavy, though – at 150 pounds, it weighs as much as I do! 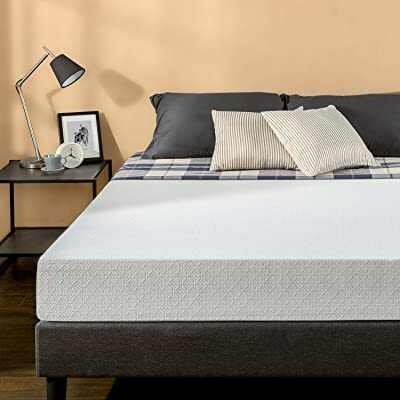 Pressure-relieving gel-infused memory foam creates a comfortable and breathable surface for you to sleep on, while the high-density base foam ensures your body stays well-supported, no matter what your sleeping position is. The mattress walks that fine line between firmness and softness. I think that, even with two people with entirely different preferences sleeping on it, it would still be able to deliver the desired level of firmness to both of them. And that’s something not a lot of the best mattresses for back pain can achieve. The Classic Brands model is the only one on this list of 2019’s best mattresses for back pain to have a quadruple-layer design, so that, in and of itself, has to be a bit impressive, right? Furthermore, memory foam is gel-infused for a cooling effect that will keep the temperature under control throughout the night. Oh, and did I mention it comes with two memory foam pillows at no extra cost? Unlike most other models on this list, this Classic Brands memory foam mattress comes with a 25-year warranty, which, you have to admit, is pretty impressive compared to what other manufacturers have to offer. I’ll be honest with you – the mattress is on the pricier side, especially if compared to the majority of other models on the list. You have no idea how big a 14-inch mattress is until it finally arrives, and leaves you speechless (and just a tiny bit breathless). You can look at pictures all you want, but nothing prepares for how massive this thing is. I still can’t find the right sheets for it, and it’s killing me! Laugh all you want, but the struggle is real. The mattress combines the softness of Snuggle-Flex memory foam with the support of the firmer base foam layer. And speaking of support, there’s a noticeable lack of it around the edges, which makes it quite easy to roll off the bed in the middle of the night. Don’t say I didn’t warn you. It doesn’t matter if you prefer sleeping on your side, stomach, or back – the double-layer construction will still provide the much-needed spinal support, as well as relieve pressure from all your major joints! What I’ve noticed is that the mattress feels way too firm at first – it got to a point where I had to reconsider including it in my round-up of the best beds for back pain. However, it didn’t take long before it softened up a bit, so now it offers the right amount of conforming and support. This one’s all about breathability. Patented airflow transfer system combines surface holes with open airflow channels, which results in an unmatched level of air circulation throughout the mattress. Snuggle-Pedic offers a 20-year warranty to their customers, with free customizations, as well as a no-hassle refund guarantee. Furthermore, you get an impressive 120-night sleep trial, too. The price is a lot higher when compared to the rest of the models in this round-up, so it’s something to think about before you make the purchase. The first night I spent sleeping on this mattress went less than perfect – it felt way too firm. I was ready to call it quits, and crash on my couch, instead. Boy, oh boy, was I wrong! I’m glad I stuck it out because it wasn’t long before it softened up, and showed its true face. I guess it was just shy at first! Plus, this one came with the longest sleep trial out of the bunch – 120 nights is more than enough time for anyone to figure out if they like it or not. The last model on my list is one by Live and Sleep. The mattress combines a 2.5-inch layer of memory foam (that’s the one in charge of comfort), with 7.5 inches of high-density base foam for extra support. Your back will thank you for this! The mattress is 10 inches thick and has a medium-firm feel, which makes it suitable for back, stomach, as well as side sleepers. Thanks to the extra thick layer of high-density base foam, it offers an outstanding level of pressure point relief. Besides the breathable, high-quality materials (the foam is OEKO TEX and CERTIPUR certified), the mattress features a soft, Flex-thread textile cover. And since it’s removable, it makes maintenance a breeze. Now, most mattresses these days, including this one, are shipped in a compressed state, which is super convenient delivery-wise. However, when it’s time to decompress, some do take a bit longer than others, and sadly, this was one of them. The Live and Sleep models come with an impressive 20-year warranty, with free returns included in the offer. On top of that, it comes with a 30-night sleep trial, so if you find that it won’t work for you, you can always ask for a refund – no questions asked. The price, of course, varies depending on the size you’re getting, but overall, even at its highest point, it still falls into the “reasonably priced” category. When it comes to pressure point relief, this one has to be one of my top three mattresses out of the bunch. It has a medium-firm feel, and hitting the middle ground is always the way to go when you’re dealing with back pain. It did keep me warm all night, which, I imagine, will be a great thing during the cold winter months. For now, it just means you’ll have some AC-adjusting to do before you hit the sack. Now that you know there’s a relationship between your old mattress and your back pain let’s see what you can do to ensure your new one makes a difference. So, here’s how to pick the best mattress for back pain! Even though I try my best to help you get a better night’s rest, I am, by no means, a medical professional, and you should never take my advice as seriously as you would theirs. Your doctor has the final say in the matter, so don’t overlook the importance of consulting your doctor before purchasing the best mattress for back pain. Going to sleep at night should be the relaxing part of your day, not something that causes you to wake up to a backache. But to get a decent night’s rest, you have to make sure you’re not putting added pressure on your spine – and that’s where support comes to play. But what exactly does “proper support” mean? It’s all about combining comfort and spinal alignment – and no, it has nothing to do with the firmness of the mattress, but more on that later. When your body comes in contact with an unsuitable mattress, there will be more push-back around specific areas – usually around more prominent joints – which will lead to misalignment throughout your body, and spine. If that happens, it will put even more pressure on your spine, and before you know it, you’ve entered a vicious circle of waking up with back pain. Therefore, it’s vital to find a mattress that won’t place pressure on your joints, reducing the chances of pressure points forming to a minimum. I already talked about this in the previous two sections, and I won’t go into details here. What’s crucial for you to remember is that the best mattress for back pain has to be able to keep your back in a relaxed state throughout the night, without adding extra pressure to specific areas, and creating pressure points. It all comes down to spinal alignment, really – it’s the only proven way to cure sleeping-related back pain. You’re not the only one that confuses firmness for support. It’s a pretty common misconception, but if you’re already dealing with chronic night-time back pain, it could do you more harm than good. If the mattress is too firm, it won’t provide any support for the pressure points – sleeping on concrete wouldn’t make much of a difference. A bed that is too soft, on the other hand, will allow parts of your body to sink in, which will lead to you sleeping with your spine in a misaligned position – and of course, that’s going to hurt in the morning. So, it’s essential to find the middle ground. What I’ve discovered is that medium-firm mattresses work for most people with a bad back. One thing you need to understand before we dive into the world of mattress materials is that every sleeping position calls for a different material. That said, memory foam does seem to be the go-to material for most people with back problems – as long as it has the right density, memory foam can provide the optimal support and spinal alignment. Due to its responsiveness, latex is another highly recommended mattress material when it comes to addressing back-related issues. A lot of people with chronic back pain will tell you that latex mattresses helped a lot with pressure point relief. However, they’re a bit more expensive than the average memory foam mattress. Lastly, there’s the good, old innerspring system. Here’s where it gets tricky – for an innerspring mattress to offer full-body support, it has to have at least 1000 to 2000 independently-acting springs. They can be an excellent option for back pain treatment, but you have to be picky about it. What does my weight have to do with anything? I’m here to pick a mattress! But if you think about it, it does make sense to factor in the pounds – a 130-pound person and a 230-pound person will need different levels of firmness to get the same amount of support. Is It Possible To Find A Budget-Friendly Solution? Well, yes – while it’s true now’s not the time to settle for low-end materials and shoddy construction, paying more doesn’t necessarily mean you’re getting a better product. The key is to focus on getting the best quality and value for your money. That said, some manufacturers offer sleep trials for their mattresses – and what better way to know if you’re getting your money’s worth, than giving the bed a try? Why do memory foam mattresses smell? Yes, memory foam mattresses do sometimes smell when they’re brand new, and it’s called off-gassing. Here’s the thing – foam doesn’t grow on trees, unless you know of a tree that grows polyurethane, that is. As the mattress sits in its air-tight packaging, the VOCs break down into a gaseous form and slowly build up over time, so when you finally open it, you’re greeted with a chemical, paint-like odor. The best way to clean a memory foam mattress without ruining its properties is with regular vacuuming. That’s right, regular – the longer you wait between two cleanings, the harder it will be to keep your mattress in top notch condition. If the cover is removable, don’t forget to pop it in the washing machine (check the label first, though) every other week, too. What’s the best mattress firmness for back pain? If you’re dealing with nighttime back pain, it’s best that you go with a medium-firm mattress, since they allow the spine maintain its natural position while you sleep, but still provide support where it’s needed. Why does my memory foam mattress make me sweat? One of the most common issues people report about memory foam mattresses would be that they sleep hot – and there are a couple of perfectly good reasons why sleeping on one often leaves you sweaty. First off, you have to take the compact structure of foam into consideration – there’s not a lot of air circulating in there. On top of that, memory foam tends to trap your body heat, reflecting it back at you throughout the night. Add a polyester cover into the mix, and you’ve got yourself a home sauna. Yes, your memory foam will eventually sag, but if you choose your mattress wisely (and go for high-quality memory foam) at least a decade should go by before the foam gives away, and develops a permanent dent. Okay, it’s time to make a decision – which one of the models I’ve talked about deserves the title of the best mattresses for back pain? Well, I’m usually pretty good at making these types of choices, but I struggled with this one. 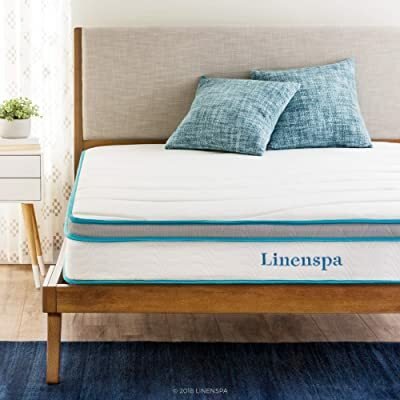 Ultimately, though, I would say the title goes to the Linenspa 8 Inch Memory Foam and Innerspring Hybrid Mattress. There’s no such thing as the perfect mattress for everyone, though, so let me know if you agree with my choice!